As I continue to use the Pencil with the iPad Pro, I can’t help but compare it to some of the 3D Touch features on my iPhone 6S Plus. Both devices use extra bits of technology to register and calculate force — and both devices can react at the OS-level to differing applications of force. The iPad Pro can’t have 3D Touch in the same way as the iPhone can because it lacks the pressure sensors built into its screen, but there doesn’t seem to be anything stopping it from integrating similar features via the Pencil. However, what should those features be? If you’re a Mac user, then Peek and Pop is like the iOS equivalent of Quick Look. You press on an icon or item to see a small preview window, and then press harder to actually launch into that window. There are areas of iOS were this feature still feels a little gimmicky. I won’t need to peek into an email or a chat within iMessage on the iPad Pro because I usually use the device in landscape, so the sidebar will always display on the left side. There would be no appreciable difference in these kinds of apps. However, I would love to be able to preview links within Safari with Peek and Pop. As I discussed previously, surfing in Safari is made more comfortable with the Pencil, and I think link previews would be a very natural addition to the app. I imagine pressing on a link would expand it to take up the Safari screen, and pressing a little harder would simply load it fully as the current page (requiring me to pres the “Back” button if I wanted to revisit my previous page). Text selection did get a little better in iOS 9 with the shortcuts added to the software keyboard, but I’d love to be able to lasso text a little faster when using the Pencil. The idea here is that the Pencil should offer to activate a few extra features focused on the idea of increased precision, since that’s really why I’d want to pick a Pencil up in the first place. If I want to select text right now, I still have to double tap on it, just like I would with my finger. 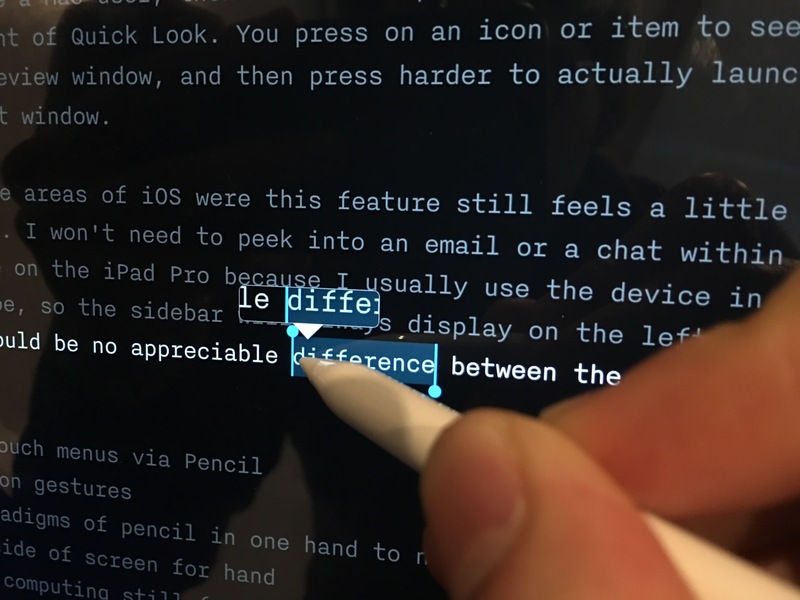 A faster way to do this would be to press on the text to instantly start to highlight it, then drag the Pencil around the screen to expand or minimize said selection. It would also be great to have a further shortcut for cutting and dragging text with the Pencil: pressing a little harder to lift the text from the page. Letting go at this point would drop the whole block of text wherever the Pencil tip was situated on-screen, or throwing the text to the side would simply take it right off the page. This is something that a lot of drawing apps — like Evernote and Paper — can handle already for images within iOS, but I think it would make a lot of sense to apply to text as well. The downside to these imaginary new features on the iPad Pro is that you wouldn’t feel them in the same way you can on the iPhones 6S. The iPad lacks any kind of vibration motors, so there wouldn’t be any kind of feedback except for visual cues and animations. However, I don’t think this would be a dealbreaker. As long as the animations happen quickly enough and feel responsive, I don’t think the experience would suffer much at all. The one aspect I do have my doubts about is how the iPad Pro will react in different sitting conditions. I’ve used the Pencil a lot on the desk with my Smart Keyboard, and I’ve never tapped the screen so hard that the screen was in danger of falling over. However, that stability changes a lot when the Smart Keyboard and iPad are on my lap. The lack of stability in that case is far more noticeable, and I end up having to cradle the iPad a little with one hand, and draw on it with the other — or just collapse the stand altogether and use it as a slate tablet. However, the one thing I do feel sure of is that there are more ways that Apple could make the Pencil into even more of a power tool, without having to release new hardware. There are plenty of little nooks and crannies within iOS that could Pencil-optimized, and I’m hoping to see more of that addressed in iOS 10.